Allow me to introduce you to Agent BillMurray. Bill is your classic triple threat: A bumper, a New Order agent, and star of the award-winning 1993 film Groundhog Day. Bill hails from a place called Sinq Laison, a region of Gallente highsec. His home system, Brapelille, is far from current New Order territory, which is all in Caldari highsec at the moment. But that hasn't stopped Bill from giving the ice miners of Brapelille a preview of what life under the New Order will be like. Here is a report he sent me, in his own words. 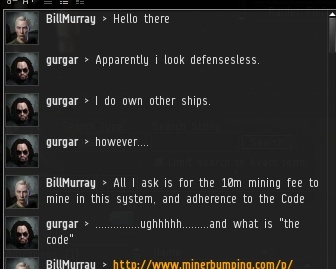 Bad news from Brapelille, miners are starting to threaten me. 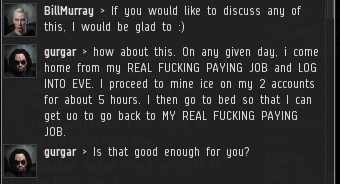 One miner, gurgar, convo'd me about my stellar work bumping him away from his ice asteroid. Of course, he proceeded to vent at me. I understood and let him. I reassured him that although his personal life was falling to shambles, his mining would not suffer for one second with me around. Then he drops the child support bomb, which I'm surprised is not the free space on Miner Bingo. Granted, I shouldn't be one to talk. Even popular actors like me had to go through messy divorces, and I lost custody of my sons to my first wife. Or my second. Knowing his situation, I lent him some advice. He would not budge, defiantly refusing the New Order's generous offer. Instead, he made a counter-offer of suiciding a Rokh. At this point, let me note that there was Concord already in the belt that someone had spawned to defend against suicide attackers. Even if he were to shoot, the Space Police would vaporize his ship in an instant. Even without the police I wouldn't be scared. Not without my trusty Stabber, Team Zissou. Said Rokh was 3 systems away, and it took 40 or so minutes for him to retreive it. I made sure he was okay and did not get lost. I had my map open just in case. He gave up. in the face of the New Order of Highsec, with his battleship primed and ready to go, he could not squeeze the trigger. 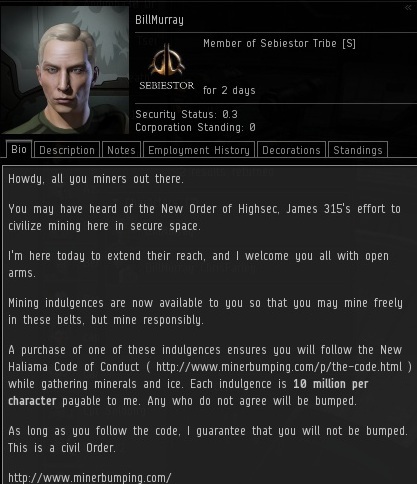 I hope to see him tomorrow and request his now 30 million isk mining fee and devotion to following the Code. 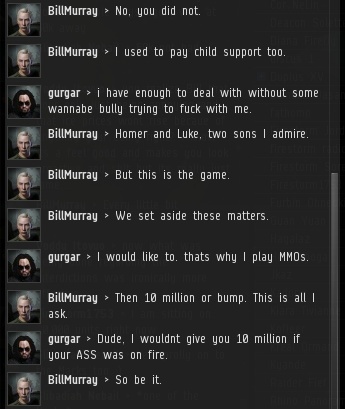 Bill's story has a happy ending: Yesterday he informed me that gurgar paid him the 30 million isk necessary to leap from the Red Pen List to the New Order. It would have been cheaper to simply pay the 10 million in the first place, but every miner learns this lesson at his or her own pace. He's taken heat from other miners for switching sides, but now gurgar has the whole New Order family cheering him on! Mr. Murray is a gentleman and a scholar.